The custom of burning the Yule Log goes back to, and before, medieval times. It was originally a Nordic tradition. Yule is the name of the old Winter Solstice festivals in Scandinavia and other parts of northern Europe. People would feast to celebrate the days finally becoming longer, signaling the end of the winter season. To cleanse the air of the previous year’s events and to usher in the spring, families would burn logs decorated with holly, pinecones or ivy. Wine and salt were also often used to anoint the logs. Once burned, the log’s ashes were valuable treasures said to have medicinal benefits and to guard against evil. Some groups claimed the ashes would protect the bearer from lightning—an important quality at a time when houses (and most of the contents in them) were made of wood. 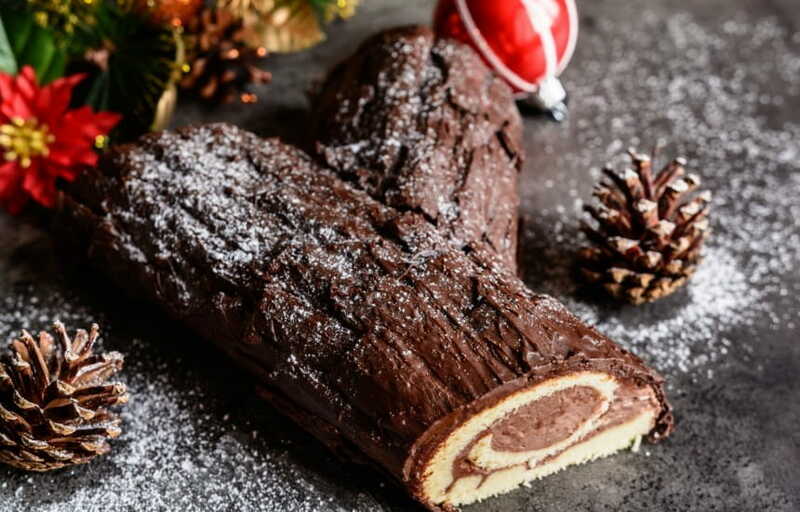 With the advent of Christianity and the changes in heating and cooking technologies, the tradition of the Yule Log changed from burning a large log to baking a dessert the resembles a log. The first Yule Log, Büche de Noël, recipe appeared in the 1600’s. It has become a traditional dessert for the Christmas holiday. It is traditionally made of a Genoise sponge cake, which is one of the oldest cakes in the world, that is baked in a swiss roll pan. It is filled with a chocolate buttercream and then rolled up. One end is usually cut off and then the cake is covered with with more chocolate buttercream. The piece that was cut off is then placed on the top or the sides and covered with more buttercream. The icing is then raked with a fork to make it look like bark. The log is decorated with berries or mushrooms that are made with meringue or marzipan. We will be offering Yule Logs, or Büches de Noël, for sale again this year. We are taking orders for Yule Logs at this time. Please contact us in person at The Frenchman’s Corner to reserve your Yule Log for your holiday party or Christmas celebration. You can also email us at info@thefrenchmanscorner.com or use the form below. Originally from south central Pennsylvania, Edward moved to VA in 1997 with his spouse and finally to Culpeper in 2013 when they decided to purchase a pre-civil war antebellum home. The home needed a lot of work to bring it back to life. It has been and remains to be a lot of work, but every bit of it has been incredibly rewarding.